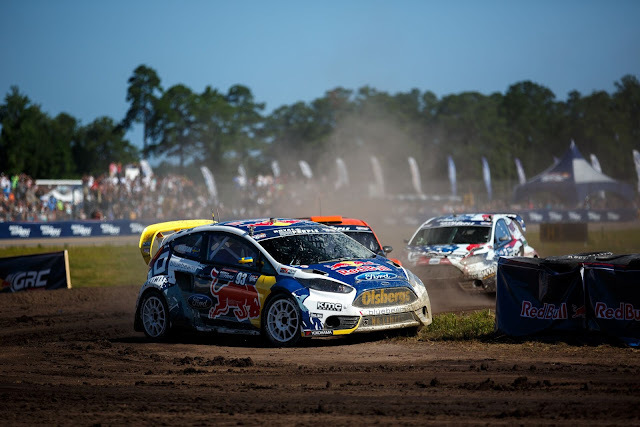 JACKSONVILLE, North Carolina (July 8, 2015) - Olsbergs MSE's Red Bull Global Rallycross drivers Joni Wiman and Sebastian Eriksson showed good pace in their Red Bull/Bluebeam Ford Fiesta ST cars this weekend but didn't earn the results to match after mixed fortunes in North Carolina. Wiman looked promising early in Round 4 of the championship, finishing first and second in his opening heats. He had a confident start to his semifinal until his gearshift lever broke, costing him a fraction of a second on every gear change. Even so, he hung on for third place to bypass the last chance qualifier and advance directly to the final. Eriksson, meanwhile, broke a rear wheel after contact with another car in his first heat. He came back for the next race to finish second and capitalized on a blistering start in his semifinal to lead from the green flag to the checker and secure pole position for the main event. In the final, Eriksson got into another tangle, this time taking damage to the steering in his car. The race was halted under a red flag, due to an unrelated crash on the course. Under red flag rules, teams are not allowed to repair cars between starts, so Eriksson elected to move himself to the back of the grid for the restart. "I chose to start last in the final so I wouldn't be in anybody's way -- I didn't want to cause trouble for anyone else," said Eriksson, who returned to the race despite the mechanical issue in an effort to maximize his points-scoring opportunity. On the restart, he finished ninth, two laps down, and scored 10 points. Eriksson is now second in the championship behind race winner Ken Block. While Eriksson struggled on the restart, Wiman was on pace for a podium until his motor failed just a lap short of the checkered flag. "I was right behind Ken and looking for an opportunity to pass," said Wiman. "But then the white flag was out and I passed it when the engine blew completely. That was it." He recorded an eighth place result. A post-race analysis of lap counts revealed a timing and scoring error had extended the length of the competition by one lap. Officials ruled that while Wiman did not pass the checkered flag, he had indeed completed the prescribed number of laps. He was awarded second-place points. In addition to the Supercars competition, a field of 11 Lites cars battled it out at MCAS New River. Olsbergs MSE driver Oliver Eriksson finished second, while teammate Austin Cindric brought his Lites car across the line in fifth. The teammates are now tied for second in the points standings. "My biggest competition is definitely my teammate," said Eriksson. "We're going to have a good fight for this championship." The Supercars and Lites races took place in front of a crowd some 10,000 strong on a track constructed on the runways of Marine Corps Air Station New River. The course was fast and wide, more than 30 percent dirt, and featured plenty of passing opportunities. On this special weekend, the team celebrated a special Fourth of July with members of the military community around the installation. In addition to the race, teams joined military families at nearby Camp Lejeune for an Independence Day celebration that included a live concert, a driver autograph session, and a massive fireworks display. The team is now looking ahead to a big Red Bull Global Rallycross doubleheader weekend in Detroit July 25-26. With each race worth 50 points, both drivers have a chance to move up the rankings. Full coverage of the Red Bull Global Rallycross Championship airs live on NBC with a rebroadcast on NBCSN. Coverage of the Red Bull GRC Lites race from MCAS New River airs Wednesday at 6 p.m. ET. In Europe this past weekend, Olsbergs MSE's World RX squad of Andreas Bakkerud and Reinis Nitiss came away with a podium. Bakkerud finished third at the World RX of Sweden.